The Humble Libertarian: Rick Perry IS Ashamed To Admit He's a Christian! Rick Perry IS Ashamed To Admit He's a Christian! 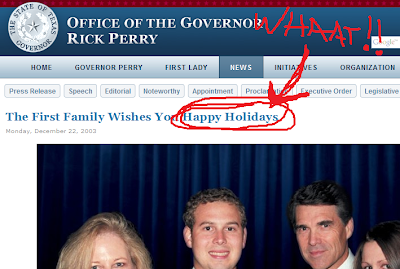 The image above is an actual screen shot from the website of Rick Perry's Texas governor's office. Link to the actual page here. I guess Rick Perry IS ashamed to be a Christian, which also makes him a liar. Happy Holidays??? Seriously, Rick? "Happy Holidays" is the bane of every Christian conservative's existence. It's an example of secularism and political correctness run amok! It's a war on Christmas! And as governor of Texas, Rick Perry was apparently on the unAmerican side!